Looking for timber decks, chipboard decks, and metal decks or mesh decks? 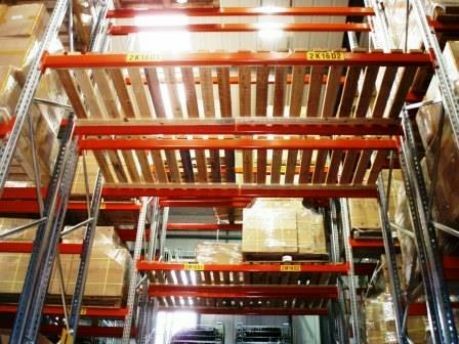 We can supply high quality pallet racking decks of all sizes at very competitive prices. The most popular are chipboard decks 2700mm long by 900mm deep or 2700mm long by 1100mm deep. We will cut your decks to size to match your pallet racking and supply blocks and brackets depending on the type of pallet racking beams and systems you use. Our metal and mesh decks also come in the sizes required with waterfall decks those that wrap of the front and back faces of your pallet racking beams or metal panel deck inserts for stepped pallet racking beams. We can provide decks to fit pallet racking beams from LINK 51, Dexion, Redi Rack, Apex, PSS, HiLo, Finspar, Polypal, Stakapal, Sperrin, SSI Schaefer, Esmena, and Stow. We can also supply both new and used pallet racking decks, all the spares and provide an installation and a FREE of CHARGE design service. So for all your pallet racking timber decks, chipboard decks, metal decks or mesh decks call 2h Storage TODAY on 01765 640 160.